By this final movie, a two-step finale, there was no bright spot in this movie. Much of this movie was filmed in remote locales from dense forests to mountainside cliffs; aside from the content being dark, even cinematographically, the movie was dark. There were no scenes that used sunlight. Even daytime scenes were always dark and cloudy days. About the brightest scene, ironically, was when Harry Potter was burying the liberated house elf he had befriended a few years ago named Dobby. 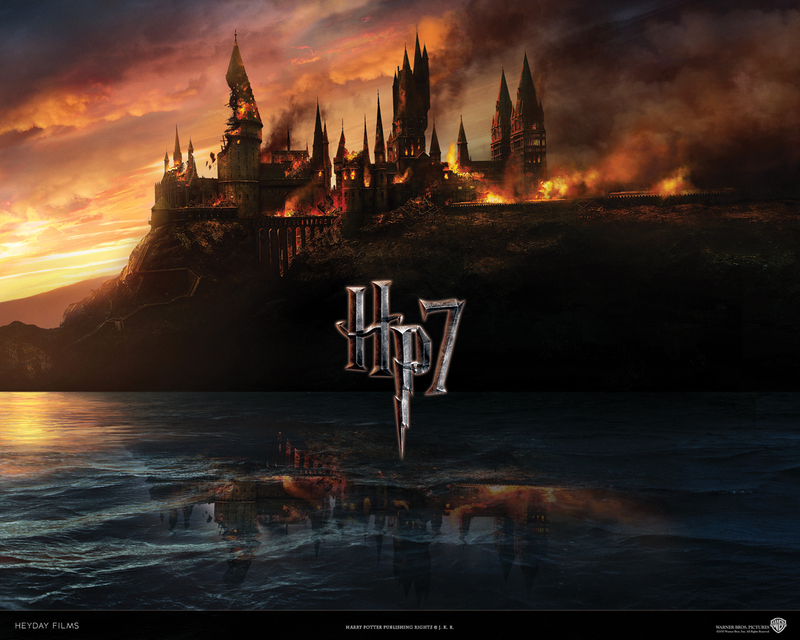 Anyone who has read the books certainly know the gripping fear that has been instilled in the lives of those in both the wizarding and Muggle world alike, and that’s about where I want to take my point of departure for the purposes of this blog. I think its more than safe to say that J.K Rowling, author and creator of the Harry Potter series didn’t have a political or religious agenda when she wrote these books, but seeing as how each book got progressively longer ending with an 800+ page tome, some of the real world parallels are hard to miss. To totally Americanize this story and read into characters that Rowling did not at all intend is what I’m about to do with full foreknowledge that I’m making this up. I want to explore the “opposition” so to speak just to make some comparisons with our own existence. So now you, the reader, is forewarned. Plot: Without going into the whole background of the story from movie one, Lord Voldemort is back and he has his Death Eaters with him. His sole purpose is to kill Harry Potter. Through nefarious acts his Death Eaters subsume control of the Ministry of Magic, and begin this propaganda against Muggles and Mudbloods alike in favor of Wizards as a superior race of creatures. Concurrently, Harry Potter and his two friends Hermione Granger and Ron Weasley are on a hunt for the horcruxes (if lost, you need to see movie six). 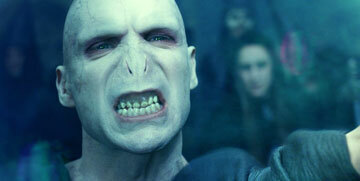 The horcruxes contain fragments of Voldemort’s soul and act as objects, if destroyed, will in turn weaken Voldemort. This movie climaxes with a showdown between Death Eaters and Voldemort retrieving an object needed for his continued immortality. Lord Voldemort — Particularly given Voldemort ethereal status until the end of the last movie, I certainly see Voldemort as fear personified. First making an appearance on the back of a professor’s head in the first installation, he’s come a long way: first inhabiting a person, then becoming a ghost of spirit, not quite tangible to finally having a complete human form. In our American culture, we certainly operate off of fear. Most recently, the whole ruckus surrounding the TSA and pat downs versus the body scanners has struck fear in our hearts. And certainly entities such as the Tea Party and even conservative factions in this country count on instilling fear in Americans surrounding health care, immigration, abortion and other flashpoint topics. What I thought was great that the movie showed how afraid the Malfoy family had become. Once portrayed as a towering character of a man, Lucius Malfoy, father of Draco, had been reduced to a cowering wimp of a man, unshaven and acting out of fear of Voldemort. 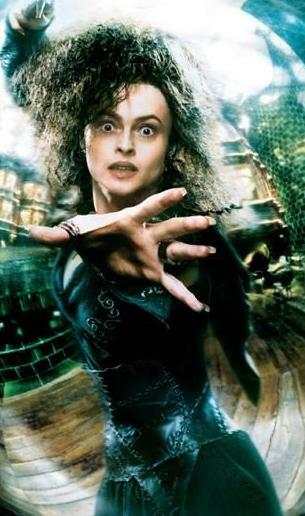 Bellatrix Lestrange — Bellatrix is one of those fanatical persons who actually is a real life version of the non-tangible fear; she is the reason why we fear. She has left a blood trail steeped in her fanaticism of pure-bloods [of Wizards] against Mudbloods and Muggles alike. 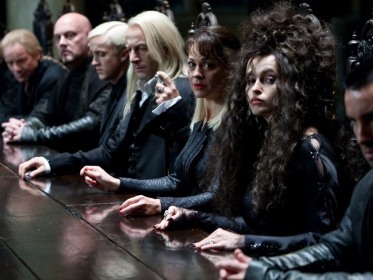 I think Bellatrix, would be a rabid member of the Tea Party. She’d be the horrible combination of Senator-elect Ron Paul, R-Ky., and failed GOP candidates Sharron Angle and Christine O’Donnell. Bellatrix has bought into the ideal of pure-bloods being better than Muggles and so much so that she has killed on behalf of Voldemort, which is synonymous with fear: so because of her fear, she felt justified to torture, kill and maim others. She’s one of those nasty characters in the movie that just won’t die. So far in the movies, she’s done more killing than she’s dong dying. It leaves a very realistic message in the minds of the readers and viewers alike that people like her do exist and they don’t give up or go away without a nasty and bitter fight and a fight where the good guys take more casualties than the ones who clearly have evil intentions. Dolores Umbridge — Admittedly, I didn’t like Umbridge for personal reasons. Honestly, she reminded me of my 1st period World History teacher from 9th grade. I just remember reading the book and having projection issues. Every time I read “Dolores Umbridge” my mind translated it to “Ms. M. Sl——” from the 1998-99 school year. That’s my personal hangup, but we saw her in the fifth installment usurp her power to become the High Inquisitor of the Ministry of Magic under an impotent and ineffective Minister of Magic Cornelius Fudge (who for me was a clear George W. Bush parallel). Aside from being the eyes and ears for a Ministry of Magic on Dumbledore and Hogwarts activities, she was actually a sadistic woman. She tortured Harry in her class by making him write lines with a pen that would etch what he wrote into the back of his hand. 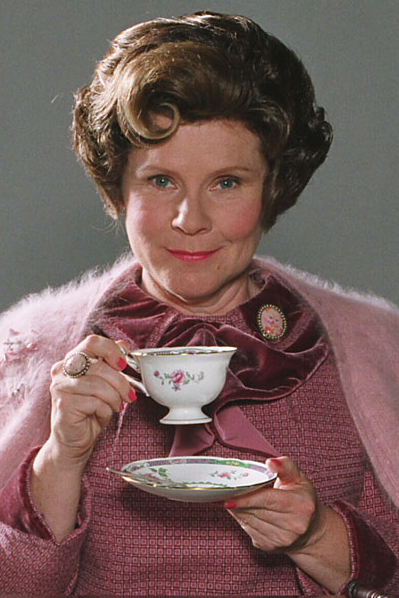 Dolores Umbridge -- Don't let the smile and tea fool you. I think what made Dolores Umbridge uniquely evil was that she was sadistic–she got great joy out of others’ pains. She would wear a smile on her face and let out a chortle as she was meting out her pain. We saw her utter disregard for other life forms when she met the centaur’s in the fifth installment as well. Here in this last installment, she has been as the head of Muggle Registry, essentially declaring the pure-blood status of persons, or declaring the real Americans Wizards from those who aren’t. It wasn’t hard for me to equate Sarah Palin with Dolores Umbridge. The two have a thing for power and authority over another. Although honestly, I don’t know who would be worse to be elected in the United States. By all accounts, Umbridge is a high functioning individual, evil as all get out, but high functioning. You don’t see Umbridge doing reality TV shows and making guest appearances on decidedly unpresidential venues such as “Dancing With The Stars.” I don’t know what would be worse, the dumb and deliberate Palin (yes, please believe she knows what she’s doing) or the intelligent and calculated Umbridge. I will say that based on the book and the movie, it’s unclear whether Umbridge is unaware of who she’s really working for. She’s never come forward as a Death Eater, but just as a rabid and evil individual interested in maintaining Wizard superiority. At times I say the same thing about Palin and other Tea Partyers: they’ve latched onto this intangible idea of fear and ran with it. All are afraid to stand up to it and confront it. I hadn’t read a fiction work since before grad school because of the book load just for classes for the last four years. I used to be a Stephen King fan all through high school and some of college. Having amassed over twenty Stephen King novels, placed prominently on my shelf, once I got through his classics, I slowly petered out not necessarily favoring some of his later works. And personally, I never got into the Dark Tower series. Nevertheless, Stephen King is a great American novelist. His subject matter aside, the man can tell a story and tell you about a character wonderfully. I feel that I know about the state of Maine because of him and intimately know about the communities and towns of Castle County, ME and Castle Rock, Derry and Little Tall Island in that state. Suffice it to say, I was in Target this September and a book cover caught my eye entitled Under The Dome. It’s the story of a small community in Maine that one day experiences an invisible and mostly impermeable barrier that cuts them off from the rest o the world. No bullets, no missiles or highly corrosive acids can break this barrier. As a result a power play begins between two men of the community. Long story short, one of the men plays on the fears of the townspeople, the other doesn’t. One is an elected official, the other almost has drifter status respectively. King through his unabashed liberalness and progressive thinking paints the elected official as a crazed megalomaniac with the town as his kingdom. As I read this story, I saw myself making these real world comparisons, and these were comparisons I didn’t make when I read the unabridged version of “The Stand” when I was in 8th grade. No, I’m sure King wasn’t writing a political commentary as Arthur Miller was with the fictionalized historical account of the Salem Witch trials and the Red Scare in “The Crucible,” but certainly, my 8th grade naivete had gone. So as I watched the characters of Voldemort, Bellatrix Lestrange and Dolores Umbrige and read about “Big” Jim Rennie in King’s Under The Dome I found myself getting caught up in fantasy world where the characters had become real. So this was not just a result of good writing from good authors and a director and script writer who caught the essence of the authorial intent, but really an end of innocence. No longer is Harry Potter just a childhood fantasy world, but rather indicative of real life battles and wars that we as humans and individuals have to fight. Just as in the Wizarding and Muggle worlds and in the small Maine hamlet of Chester’s Mill, casualties will be endured and loved ones will be martyred all moving toward one greater cause. I think we can take life lessons from the protagonists of these imagined worlds that victory doesn’t come without some defeats, and that even if you don’t experience victory personally, just to know that you fought on the winning side. Loss of innocence is another name for both emotional maturity and spiritual growth. The ignorance is bliss is true only if you are relatively young, poorly educated, and deliberately dumbed-down, socially and politically. Interesting November theme: You cannot awaken those who pretend to be asleep; nor can you speak to those who pretend to be deaf. Preach on, many are asleep. When they awaken, they seek consciousness. The deaf are simply scared out of their minds and are no longer able to hear truth, unvarnished or otherwise because they are the power that truth speaks most directly to. Really enjoyed this post. Spouse and I plan to see the Harry Potter movie this week. May not read the Steven King book unless I take a long car trip. Thanks for this post (and the many others). I enjoyed this post even though I didn’t read it in its entirety. I’ll take Professor Umbridge over Sarah Palin. Good short review for King’s Under the Dome. I’ll add it to my to-read list. Fiction. I’ve been overdosing on fiction lately. Slowly but surely I’ll get back into some non-fiction. I’m a little bit tired of parenting books and articles but I force myself to go on. @dowl, I appreciate your comments. Parenting books? lol how many little ones you got? One child, 6-months old. That’s it, I’m keeping it simple.